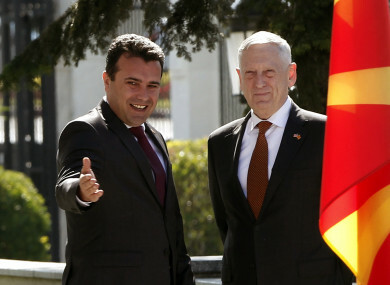 Macedonian Prime Minister Zoran Zaev welcomes US Defense Secretary James Mattis to Skopje. Today, Macedonians will head to the polls to vote on whether to add “North” to their country’s official name and end a decades-long dispute with Greece, a province in the north of the country – so why the change? Greece has refused to recognise Macedonia’s name since the Balkan country declared independence from Yugoslavia in 1991. The animosity deepened when Macedonia’s former premier Nikola Gruevski went on a construction spree in the capital Skopje, erecting massive statues of Alexander the Great – a hero both countries claim as their own – and plastering government buildings in hellenic-inspired facades. But Gruevski’s downfall and the arrival last spring of a new government led by Macedonia’s Social Democrats, allowed for an opening. It is not just about the country’s official name. The key clause is Article 7, which says the terms “Macedonia” and “Macedonian” refer to “a different historical context and cultural heritage” for each country. But Macedonians will no longer be able to claim ties to the “ancient Hellenic civilization, history, culture and heritage” of Greece’s Macedonia province, according to the deal. Does a ‘yes’ vote solve the issue? No. The referendum is only “consultative”, according to Prime Minister Zaev. Zaev is hoping a strong approval from the public will make it difficult for the party to ignore the people’s will. The US has accused Russia – which is openly opposed to Nato’s enlargement – of running a disinformation campaign pushing for the referendum to fail. “No doubt that they have transferred money and that they are also conducting a broader influence campaign,” US Secretary of Defense Jim Mattis said last week on a visit to Skopje. Premier Zaev played down the allegations, saying, “we don’t have proof about Russian influence”. Where is the ‘no’ campaign? For now, mostly on social media, trailed by the hashtag #Bojkotiram”, which means “boycott” in Macedonian. Thousands of fake accounts on Facebook and Twitter are helping amplify its affect, according to Macedonia’s Investigative Reporting Lab, an NGO. In August a story went viral alleging Nato would use depleted uranium at a Macedonian army base. The Defence Minister later denied the report, calling it “fake news”. In an interview this month with AFP, Zaev warned that a failure to pass the referendum would isolate the country and could open a new “chapter of insecurity and instability in the whole region”. “It would just be a real setback, on all sorts of levels, if this didn’t go through,” said James Ker-Lindsay, a Balkans expert at the London School of Economics. “We know that there won’t be any going back to the table,” he added. Email “Today, Macedonia votes on whether it should add 'North' to its name. Here's why”. Feedback on “Today, Macedonia votes on whether it should add 'North' to its name. Here's why”.